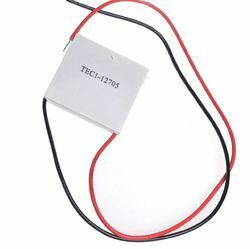 DESCRIPTION: The Thermoelectric - TEP-1264-1.5 power module is designed and manufactured by our patented technology for converting heat source directly into electricity. 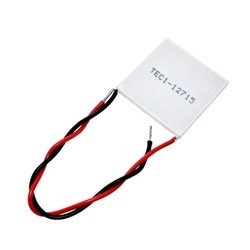 The module is Bi-Te based thermoelectric module that can work at the temperature of as high as 330 °C (626 ) heat source continuously, and up to 400°C(752)intermittently. 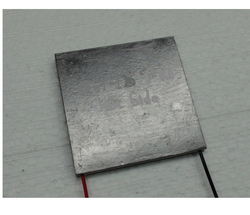 The thermoelectric module will generate DC electricity as long as there is a temperature difference across the module. The more power will be generated when the temperature difference across the module becomes larger, and the efficiency of converting heat energy into electricity will increase, therefore. The module is stuck with the high thermal conductivity graphite sheet on its both sides of the ceramic plates to provide low contact thermal resistance, hence you do not need to apply thermal grease or other heat transfer compound when you install the module. The graphite sheet can work well at extremely high temperature. The 127 couples, 40mm x 40mm size module is a single stage module which is designed for cooling and heating up to 90°C applications. This device must be used in conjunction with a heat sink to avoid burned. Get ice cold in minutes or heat to boiling by simply reversing the polarity, used for numerous applications such as cooling your CPU, video card, NANO Reef, laser diode, CCD camera, picnic cooler, beverage cooler , alternate power sources, or even for your own custom car drink warmer/cooler. Since they consit primarily of semiconductor material sandwiched between ceramic plates and have no moving parts. 5.Lead wire 150mm as defaut. 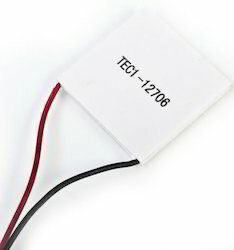 Looking for Thermoelectric Module ?